When our project began one of the first bloggers to write about us was Brian Webb. Ever since then he's been a great supporter of Vancouver, we love you and we've seen him out and about at various events we've been at. He also helped promote our limited edition Rainbow t-shirt last summer. And looked really good wearing it! In February Brian competed in the 2012 Mr. Gay Canada competition and won the People's Choice Award! Not that surprising though, Brian's a popular guy. His lifestyle blog covers food, drink, including the popular Cocktail of the Week, and travel, mixed with entertainment and nightlife, product reviews and healthy living articles. Check it out some time! What are some of Brian's favourite things about Vancouver? 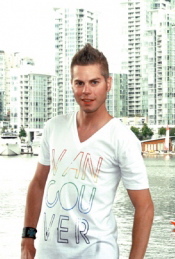 "Yaletown, Vancouver Pride, Seawall, Stanley Park, Running Community, Healthy/Active living, Accessability…. best place on earth!" Want to be featured here? Email us a photo and your reasons for loving Vancouver!